HomCom presents their portable party system, a 100 watt Bluetooth speaker with built-in light show that lets you bring the party vibes with you anywhere you go. Stream sounds wirelessly using any Bluetooth-enabled device and watch the light display project one of seven dazzling shows along with your music. A multitude of input/output and adjustment options keep the party pumpin' into the night. ✔ FEEL THE MUSIC AND CONTROL THE SOUND: Naturally amplified output from two 10✔woofers and two 1" tweeters fills your indoor or outdoor space with great sound. An audio equalizer offers controls for bass, treble and mid levels allowing you to fully adjust the audio. 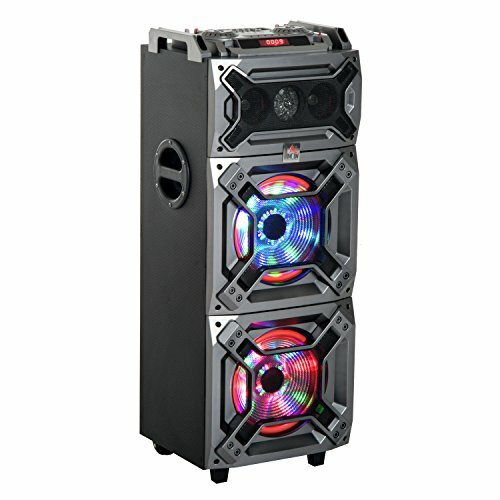 ✔ TOUGH, PORTABLE, CONVENIENT: A durable cabinet design protects the speaker system while the conveniently designed wheels and telescopic handle makes it easy to to take it on the go. ✔ BLUETOOTH CONNECTIVITY AND MULTIPLE INPUTS : Play music tracks via any Bluetooth-enabled device and connect to non-Bluetooth devices using the ✔-inch (3.5mm) aux port. Combine multiple live inputs (Bluetooth, FM Radio, USB port, SD slot, mic and guitar) and the mic with karaoke tracks or your favorite tunes. ✔ DYNAMIC LED EFFECTS: Create an instant disco party atmosphere with the multi-mode LED light display that projects seven brilliant light shows onto any surface. ✔ MICROPHONE INCLUDED: Start your rockstar days right out of the box with the microphone, cable and remote control that are included for your convenience.